In a readout released yesterday by the White House covering a phone conversation between the US and Turkish leaders, President Trump reportedly urged Turkey's President Erdogan to de-escalate the country's military incursions in northern Syria, following a Turkish offensive there to rid the area of Kurdish fighters. There was just one problem: in a statement released overnight, the Turkish presidency said the White House had lied about much of the content in its readout. 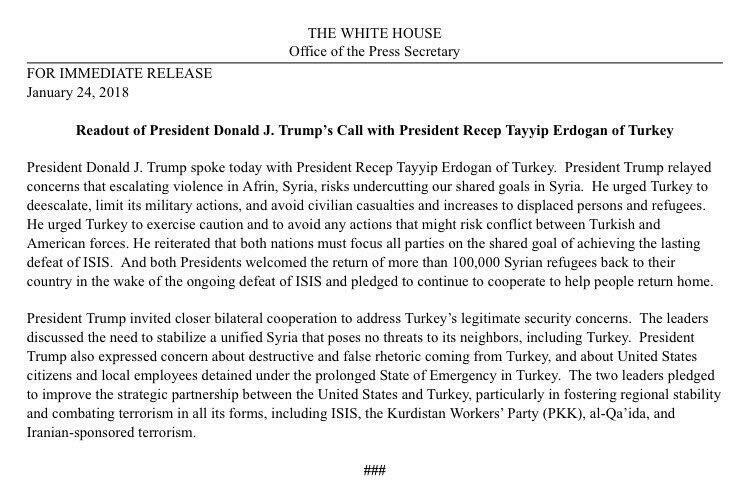 "The readout issued by the White House does not accurately reflect the content of President Erdogan’s phone call with President Trump." "Trump did not share any 'concerns [about] escalating violence' with regard to the ongoing military operation in Afrin. The two leaders' discussion of Operation Olive Branch was limited to an exchange of views," an official told Al Jazeera. The White House readout of the phone call said that Trump "relayed concerns that escalating violence in Afrin risked undercutting their "shared goals in Syria" and that "He urged Turkey to de-escalate, limit its military actions, and avoid civilian casualties and increases to displaced persons and refugees." Trump also warned Erdogan against bringing US and Turkish forces into conflict, according to the White House. Washington has about 2,000 ground troops in Syria. The White House statement said: "President Trump also expressed concern about destructive and false rhetoric coming from Turkey, and about United States citizens and local employees detained under the prolonged state of emergency in Turkey." However, the Turkish official denied there was any mention of the state of emergency or the phrase "destructive and false rhetoric coming from Turkey". "[Trump] mentioned that open criticism of the United States raised concerns in Washington," according to the source. In response, Erdogan stressed that a number of US policies, including Washington's military support to the Syrian Kurdish fighters and "its harbouring" of Fethullah Gulen - a self-exiled Turkish Muslim scholar - caused "outrage" among the Turkish people, the source said. There was no mention of the state of emergency in Turkey, according to the Turkish response. Regarding the release of US citizens imprisoned in Turkey, Erdogan told Trump that there was rule of law in his country and highlighted that the independent judiciary would reach its verdict following the completion of relevant indictments. Erdogan also said that the US-backed Syrian Kurdish forces must withdraw to the east of the Euphrates River in Syria and pledged the protection of Manbij city by the Turkish-backed Free Syrian Army against future threats by the Islamic State of Iraq and the Levant (ISIL, also known as ISIS) armed group. The US and Turkey - NATO allies - have diverging interests in Syria, with Washington focused on defeating the ISIL and Ankara eager to prevent Syria's Kurds from gaining autonomy and increasing Kurdish unrest on its soil. In the past year, Turkey has drifted increasingly farther away from NATO and right into Russia's zone of influence as the battle for influence over this key Asian gateway nation continues.